Holy Cow, my dog is a democrat! The Homeland Security Chief, Janet Napolitano said our security system worked well after the terrorist bomb attack on an aircraft landing at Detroit. Days later, Obama finally talked about an “isolated incident”. Days after that Napolitano acknowledged that there was a failure in the intelligence system. Days after that Obama finally talked about serious flaws in our intelligence system and admitted that weeks before the “attempted attack” much was known about the suicide bomber he finally described as “an extremist”. It’s now clear that the potent explosive material the suicide bomber carried was consistent with other terrorist bombings and is not readily available. Also it’s now clear that Al Qaida in Yemen has played a key role in this bombing and the Fort Hood attack. What’s with the “attempted” thing? The device was activated and detonated; it set the plane on-fire! 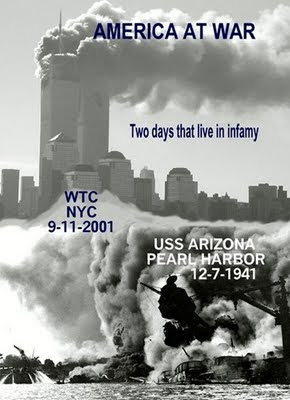 How many folks need to die or be injured before Obama and his team will use the word attacked? Obama is a very learned academic, but still cannot say the word “TERRORIST” or “TERRORIST ATTACK” relative to this incident or to the Fort Hood terror attack by Major Nidal Malik Hasan. What is his problem? Oh yes – during the campaign and during his inaugural address he declared the “war on terror” was over and he was launching a campaign of “appeasement without preconditions” with all the folks who are trying to destroy us. Wouldn’t want to disturb the wonderful success he’s having with that approach. At what point, or after how many Americans are killed and injured, will Obama wake-up and hear and smell the bombs going off and react in an appropriate manner? And, when will the liberal media start holding Obama and his team to the same critical standards of critique they applied to George Bush? How about an expose on the totally political nature of the appointments of Janet Napolitano to Homeland Security and Leon Panetta to CIA chief, to key national security cabinet posts, without any experience or qualifications for those job appointments by either one. How’s that working out for us now? Just More Hope and Change we can believe in! Yes we can! A very nice review of Galileo’s invention without ever touching upon the politically incorrect connection to the current debate about ClimateGate and Global Warming. Indeed Galileo studied the stars with his new invention. He also studied in detail and documented sunspots. Galileo’s sunspot data has been used to demonstrate that the period of low solar activity in the middle ages led to atmospheric changes that brought on the Little Ice Age. Sunspots were rarely observed during the Maunder Minimum in the second part of the 17th century (approximately from 1645 to 1715). This coincides with the middle (and coldest) part of a period of cooling known as the Little Ice Age. Roanoke Times, 4/5/09, Pg 11: AP: Quieter sun (fewest sunspots since 1913) bodes well for Earth. Nice for GPS, satellites, shrinks the atmospheric boundary by 125 miles and marginally reduces the global warming by about 0.3 degrees. NASA’s chief solar physicist Hathaway says we don’t know why it happens. Marginal reduction of 0.3 degrees? Note how glibly our government employee describes what is 50% of the 0.6 degree Global Temperature increase in 74 years (since 1935) as shown on the NASA data base. No wonder the ClimateGate Alarmists are having so much difficulty with their man-made CO2 warming hypothesis and find the need to “fix” data that is in conflict with their hypothesis. Was this all in Gore's "inconvenient truth" or did I miss it somehow? Roanoke Times, 12-27-09, Pg 1 & 3: Nigerian man was charged Saturday with an act of attempted terrorism of an airplane landing at Detroit. Attempted terrorism? What are Obama and his AG Holder smoking? The Muslim terrorist set off an explosive device on an airborne passenger plane that set the plane’s interior on fire! The Jihad chickens are coming home to roost and reality is setting in! Gee Michelle, I don’t think we’re at Yale anymore! Umar Farouk Abdulmutallab, a muslim from Nigeria, who had traveled to Yemen, tried to bomb a plane landing in Detroit. He was on several security lists, was “turned-in” by his father to a US Embassy as an Al Qaida security threat, but apparently consistent with Obama political correctness policy, had not yet “broken the law” and therefore was just another nice young Muslim man on a pleasure trip to the US. The height of hypocrisy is that now Obama and the Democrats are going to hold hearings to find out what went wrong. Obama and the Democrats and Liberals were happy to capture the US government so they could declare that the war on terror is over, we love all Muslims, GITMO is history and the Patriot Act is dead! How’s that working out for you now? Home grown terrorists have continued to organize and pursue their quest for jihad. However, Obama continue to avoid designating Maj. Nidal Malik Hasan a terrorist, his attack on soldiers at Ft Hood a terrorist attack and awarding the dead and wounded the Purple Heart Metals and the combat-inflicted disabilities benefits they deserve! However, Obama and Michelle did wish the troops happy holidays. Nice touch. Obama’s homeland security chief, Janet Napolitano , who for months refused to acknowledge that there is a war on terror, now clearly has show herself to be the incompetent non-experienced person she is and has been. Yet another cabinet choice based on politics and PC for a post that’s vital to our national and personal security. It’s clear that Obama’s Political Correctness Policies have become this administrations primary management focus and anyone who identifies a Muslim as a potential problem immediately becomes the focus of concern about himself. The liberals and left-wingers who have been so upset with our treatment of terrorists and Obama who just can’t close GITMO fast enough are now perfectly happy summarily killing targeted people in yet another country, Yemen! Apparently the liberals are OK with killing people without arrest, charges or legal process! They have embraced the new Obama Doctrine: Summary Execution Better Than Water-Boarding. It’s also cheaper, simpler and lots faster. Talk about your liberal bipolar-conflicted political, mental and ethical processes and the height of gross hypocrisy. Roanoke Times, 10-25-09, Pg 8: Hit list of drug kingpins worries Afghan officials. Obama has a hit-list of Afgans to target with drone-missiles strikes. He refuses to share the list with Afgan government or military. Afgan officials are worried that Obama will “act on his own to kill suspected drug lords, based on secret evidence, instead of handing them over for trial”! What a stroke of genius. - Why didn’t Bush and Cheney think of this? This item highlights the disgusting fact that Obama and team are still stone-walling the designation of Maj. Nidal Hasan as a terrorist, his vicious attack as a terrorist attack, and awarding all those killed and wounded with the Purple Heart Medals they justly deserve. Just more hope and change we can believe! Yes we can! Roanoke Times, 12-22-09, Pg 3: Obama’s Transportation Secretary, “Prince” Ray LaHood, has decreed that, if you are “stuck” on an airplane for 3 hours, the airline is fined $27,500 per passenger. I was “stuck” on I-81 for more than 3 hours Sunday after Thanksgiving – when does Gov Kaine send me a $27,500 check? Thousands of passengers have been “stuck” on AMTRAK for more than 3 hours. Thousands of passengers have been “stuck” on DC’s Metro for more than 3 hours. Tens of thousands of people were “stuck” on the public highways in this last storm, many for lot’s more than 3 hours. Thousands of people were “stuck” in airline terminals (owned by the government) during this last storm, many sleeping on the floor for two days! So when do all these folks get their big checks? Hello – the $9,000 per hour only applies to commercial carriers and NOT to Government operations! Is the government ever really responsible and accountable for anything? 1. The “less than competent” Federal Airline Controllers change take-off and landing slots after the flight is boarded and pushed-back from the terminal. 2. The “less than competent” National Weather Service can’t predict weather until it happens thereby trapping thousands of flights in process. • “Stuck” flights will be returned to the terminal, if there is a ramp available, and all passengers and baggage will be off-loaded and the fight cancelled. • If no ramp is available, passengers and baggage will be off-loaded on the tarmac (most probably in bad weather conditions). • Passengers who really want to get to their destination will be severely penalized. I was “stuck” on a flight from Albany to Chicago, on the Albany tarmac for six hours with my spouse and eight year old granddaughter. The passengers “voted” every hour to “stay the course” because going back meant: cancelled flight and rescheduled at least 24 hours later, no rental cars available, no hotel rooms available, no food left in the terminal, and spending the night sleeping on the floor in the terminal with Bubba and Junior. The passengers and crew should do their best to work through bad situations and penalties, if any, should be limited to a free ticket. Note: I have never worked for an airline but I have safely flown hundreds of thousands of miles. Ref: <?xml:namespace prefix = st1 ns = "urn:schemas-microsoft-com:office:smarttags" />Roanoke Times, 12-16-09, Pg 21: Opinion-Commentary Article by Mr. Frank Munley, Climategate. Contrary to Mr. Munley’s assertions that skeptics are either in the energy industry’s control or are very dull people, my initial views of global warming were formed by viewing land-based glaciers in Alaska and subsequently glaciers in Wash. State and southern Norway. That inspired me to look at the work published by the Cambridge Institute and other academics relative to our 250 years of natural global warming and might not be considered too dull nor inspired by “big oil”. 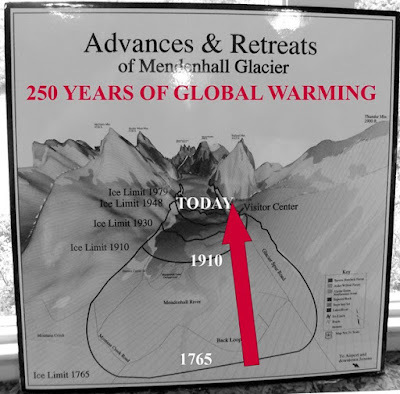 The Mendenhall glacier center highlights a graphic of the glacier deglaciation history that started from the furthest moraine in approximately 1750 (end of little ice age and start of the American Revolution) to its current location. This is not complex reconstruction; people lived there during all this time period! The graphic shows massive melting and retreat occurred from 1750 to 1950, before there was any significant increase in atmospheric CO2! I subsequently visited Nisqually Glacier at Mt. Ranier in Washington, and both Storbreen and Nigardsbreen Glaciers in southern Norway. They also have the same 1750 to 1950 history. Subsequent review of data from the Cambridge studies and other universities show that many northern hemisphere land-based glaciers have a similar history and left a similar footprint. Based on this data it is clear that all global warming data and analysis should start at 1750 (end of the little ice age) and those who propose it is man-made should explain the massive 200 years of deglaciation without significant increase in atmospheric CO2. The published NASA temperature data shows that there has only been one degree warming in the past 100 years and no net warming in the past 10 years. It’s not clear why alarmists would describe this as a crisis given the variability of earth’s climate for thousands of years. There isn’t any CO2 based explanation for the 35 years of significant cooling, from 1940 to 1975 nor is there any clear CO2 based explanation why the rate of warming is the same for the first 35 years of the 20th century as the last 35 years. All this data is inconsistent with CO2 being the forcing function for global temperature. Also the Gore-Inconvenient-Truth presentation did not point out that there was a 200 to 800 year delay from Vostok ice-core temperature changes until changes occurred in CO2 (an omission that by itself falsified the hypothesis that CO2 was the temperature forcing function). And most significantly, there is no measured hotspot in the tropics at 10 km; a key measurement parameter that is a required scientific component IF CO2 were causing warming that is clearly a hypothesis; not at the level of a theory and clearly not proven fact. These open issues form a small subset of the many unanswered issues with the IPCC Hypothesis, that man-kind is causing global warming, and should cause one to conclude that the debate is clearly not over and that the alarmists need to: publicly and openly address the many issues that exist, place all the taxpayer funded data into open-system archives, stop “fixing” data to hide results that doesn’t support their hypothesis and join in an open and constructive dialogue that will result in a clear understanding of the significant level of uncertainty in their hypothesis. Real scientists don’t manipulate data to support their hypothesis and they don’t try to marginalize and personally disparage dissenting members of their scientific community. Gore, speaking at the Copenhagen climate change summit, Dec 14, 09 , stated the latest research showed that the Arctic could be completely ice-free in five years. However, the climatologist whose work Gore was relying upon dropped the former vice president in the water with an icy blast. "It's unclear to me how this figure was arrived at," Dr. Maslowski said. "I would never try to estimate likelihood at anything as exact as this." Our 250 years of Natural Global Warming is not caused by CO2 or man-kind! At what point is the major Pravda-media going to have the integrity and intestinal fortitude to give skeptical scientists reasonable public coverage and demand professional debate? Roanoke Times, 12-9-09, Pg 11: UN: This decade is likely warmest on record. This from reliable sources that admit they falsified temperature data to hide the real facts! World temperature graph is shown as if a one degree temperature increase occurred during last ten years when in fact the one degree occurred over the past ONE HUNDRED YEARS. (Clearly NOT a crisis!) It also doesn't show that there has been NO net warming during the past 10 years! In fact, the ClimateGate scientists purposely falsified the "official" temperature data to hide the fact that some amount of cooling occured during the past 10 years! Minimum area of summer sea ice graph totally ignores the increase in the Antarctic ice coverage and the scientific record of 250 years of deglaciation resulting from natural global warming throughout the northern hemisphere, starting in 1750, 200 years before any significant increase in CO2. Rise in sea levels graph of 1.3 inches in past ten years is not inconsistent with the sea level rise of 20 cm from 1880 to 2000 (7.8 inches in 120 years) and is clearly not a crisis. For perspective consider that sixteen thousand years ago the Atlantic was 400 feet below where it is today and the Outer Banks of NC were 50 miles east out at the continental shelf. (That’s an average of 3 inches rise every 10 years or three times what it’s been for the past 10 years!). 4. Throughout this article there’s a lot of lamenting about “how hot it’s become” (as if one degree in past 100 years and no warming in the last 10 years are a crisis) but not one statement of fact that man-made CO2 is causing our 250 years of natural global warming. The Roanoke Times and their liberal press associates are so committed to the Gore-Hypothesis that man-made CO2 is causing catastrophic climate change that they are unable to be impartial, balanced and evenhanded in their regurgitation of the tripe and misinformation emanating from sources who have now been clearly exposed as unprofessional and unethical practitioners of propaganda designed to ensure they continue to get massive taxpayer grant funding to continue their activities. Perhaps the Editors of the Roanoke Times like to be associated with these types of people? As self-proclaimed stewards of Freedom of Information perhaps the Editors of the Roanoke Times should launch a major effort to determine why all the global warming data, starting in 1750, and paid for by government taxpayer grants are not released into a public database available to everyone without modification by the “tricksters”. The core issue is not the amount of our 250 years of global warming. The fact is that whatever the amount of warming, it’s not caused by CO2 or man-made and therefore it’s part of earth’s natural climate variations that have been going on for millions of years. The major media, primarily CNN, has finally awaken to the seriousness of the implications of ClimateGate however they continue to avoid the key issue: the false Gore-hypothesis that it’s man-made! They also marginalize the massive movement to suppress contrarian views including firing from their jobs highly qualified skeptic scientists like Prof. Patrick Michaels of the University of Virginia while highly rewarding those who crank out papers supporting the false hypothesis. “The Daily Show” with anchor-man Jon Stewart. Roanoke Times, 12-7-09, Pg 1 & 3: UN climate conference begins today attended by 192 countries. 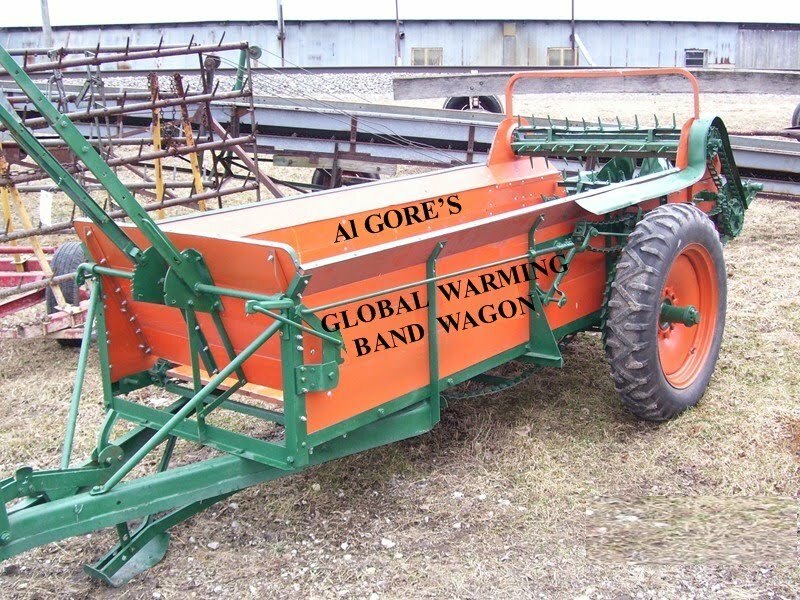 The Roanoke Times, to be in-sync with their left-wing and liberal media partners, continue to fully support the Gore-Hypothesis of man-made global warming and refuse to cover any of the contrarian news, facts, stories or views. This Pravda-like censorship by exclusion includes the current ClimateGate Scandal involving important Scientific-Alarmists who destroyed source data that is key to their so called “proof” and who have fraudulently faked data to support their hypothesis. It appears the only major news organization to cover this scandal is “The Daily Show” with anchor-man Jon Stewart. There are two key UN objectives for their climate change jihad. 1) Cripple the USA’s industrial capability so that we are just an “also ran” and not a world leader in innovation, technology and production. 2) Demand reparations from the USA for all the “undeveloped” countries (most of the 192) who continue to want to live off USA welfare. A very appropriate recognition of this major historical event. The article features a first-hand account of the event by a sailor who survived the attack and still has vivid memories of what he saw and heard. Fine print Pg 3 weather article, no hurricanes hit US mainland in 2009. No mention of Global Warming in this article! Reflect on the Pg 1 Global Warming Headlines every time in the past when hurricanes and severe storms hit the US mainland! Just as Al Gore said in his movie and presentation! Just as we saw in the movies “the day after tomorrow” and “the day the earth stood still”. Atmospheric CO2 is at a high level from both natural and man-made activity. However, the infamous Gore-Hockey-Stick was false and so is the hype about severe weather. Surprise; Apparently our 250 years of Natural Global Warming has natural variations. Natural variations are hard to predict because they’re random and don’t fit well into scripted and canned computer programs. Real programmers use Monte Carlo simulation techniques for highly variable functions. Not good for the Consensus-Alarmists because they need canned man-made global warming data without natural variations. That's why they can't explain the 35 years of significant cooling from 1940 through 1975 nor can they explain why no global warming for last 10 years nor can they explain why the rate of warming for the first 40 years of 20th century was same as the last 40 years nor can they explain why there's no "hot spot" over the tropic regions (the key signature of CO2 caused global warming)! All the source original data used by Global Warming Alarmist to cook-up data allegedly showing man-made CO2 warming has been deleted from their data bases making it impossible for scientific peer-review or audit of the conclusions. Exposed: Emails from the inner circle of Consensus-Alarmists showing deceit and malfeasance in covering up data not supporting man-made global warming and a pattern of attack upon Skeptics. What a hoot! 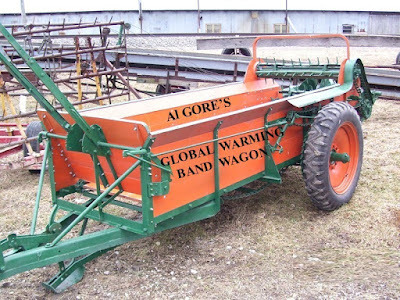 Al Gore getting his comeuppance by the internet he says he invented! Sen. James Inhofe, an Oklahoma Republican, said on Monday the leaked correspondence suggested researchers "cooked the science to make this thing look as if the science was settled, when all the time of course we knew it was not,"
The American people have rightly rejected Obama’s Cap&Tax so apparently he’s going to Copenhagen to announce what he and Michelle are doing to turn down the heat and turn off the lights in the White House. Instead of going to Copenhagen to participate in the Global Warming Alarmist Convention, Obama should be calling a summit to bring ALL the scientists together to review the real and valid data that clearly belies the Gore-Hypothesis that humans have caused our 250 years of natural global warming that began in 1750, at the end of the little ice age. One degree warming in the last 100 years and no warming in the past 10 years does not represent a global warming crisis that is clearly not man-made. Our energy dependence on our enemies is the crisis and our government has not implemented plans for any change to that dependence. * Black youth growing up in Arkansas goes on crime spree. Gets a 95-year jail sentence. * Republican Christian Minister Governor Huckabee commutes his life sentence. * Youth grows up. Moves to Wash. State goes on crime spree again, including assault on a police officer. * Wash. State courts turn him loose out onto the streets. * Assassination of four police offices follows. * Police shoot and kill rabid-person who should have still been in Arkansas jail. * Serious crimes done by youths deserve serious jail time (including life). * Politicians should stay out of judicial actions (remember Willie Horton). * Courts should remand violent felons especially those with violent records. * Interestingly, this does not qualify as a hate-crime! * How soon before Obama and his AG Holder launch a civil rights investigation into the Seattle police department’s shooting of this killer? After all, this is way beyond Obama’s “police acted stupidly” position at Yale. Interestingly this does qualify as a hate-crime! * Condolences to the families of the four fine young police officers who needlessly lost their lives while serving their communities and country. * Good luck to the police officers who brought down this rabid-assassin. They’re going to need it, and lots of defense lawyer funds too.